Falvey Memorial Library has partnered with Connelly Library, La Salle University, for the purpose of digitizing rare Bibles and other printed material from its world-class Susan Dunleavy Collection of Biblical Literature. This digital partnership agreement conveys the salient message that two major universities run by two different religious orders — Villanova University by the Augustinians and La Salle University by the Christian Brothers — are willing to use advanced digital technology whenever possible to preserve a significant part of the cultural patrimony of the Christian tradition. 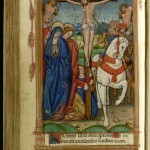 Further, the libraries of two Catholic Universities in the Philadelphia region can, in the spirit of fellowship and of academic collegiality, work together to promote the study of books precious to many different kinds of scholars interested in the sacred scripture of Christianity and its related literature, without doing harm to the books themselves. This initiative is also important because it means the commitment of resources can be made in a way that does not require fees or grants, is not designed as a commercial venture, nor is meant to generate any commercial revenue. It is simply the sharing of what already exists, namely special collections of books, in a new way for purely educational purposes. It brings to researchers, world-wide, primary sources for study for the adventure of scholarship. These sources can be made more accessible in an unrestricted way by means of the web and new tools developed by libraries, tools that are devised expressly to promote teaching and learning in the humanities anywhere and everywhere. In bleak economic times it is indeed delightful news that libraries are pulling together for the advancement of scholarship in a way that does not commodify learning objects useful to liberal education. Top right: Explicunt hore intemerate dei genetricis virginis Marie, leaf [38, verso]. 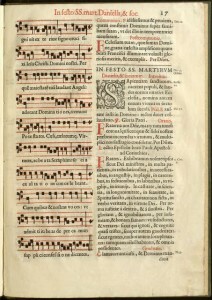 Lower left: Missae propriae festorum Ordinis Fratrum Minorum, ad formam missalis noui, page 17.